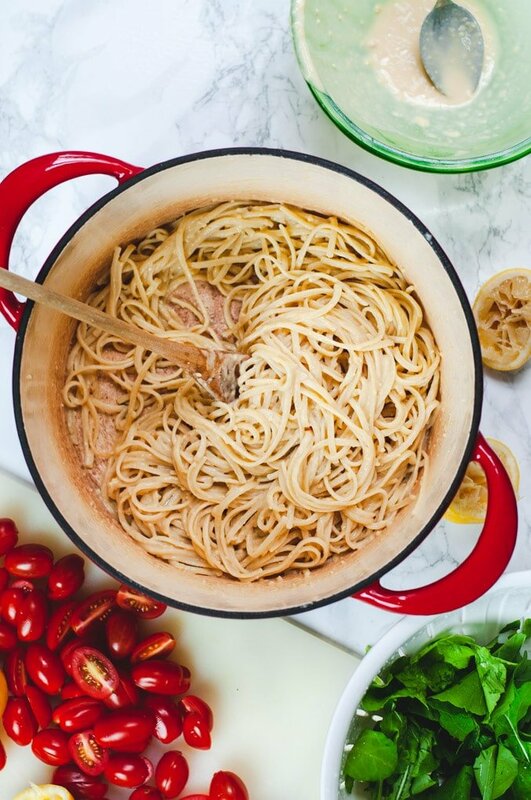 Hummus pasta is so creamy, flavorful and easy to make using pantry ingredients. This recipe is easy to customize and takes 15 minutes to make, making it perfect for last minute meal prep or dinners. This is the recipe I make when I want a quick, healthy meal without much effort. It’s a “what’s in the pantry?” kind of meal that won’t let you down! 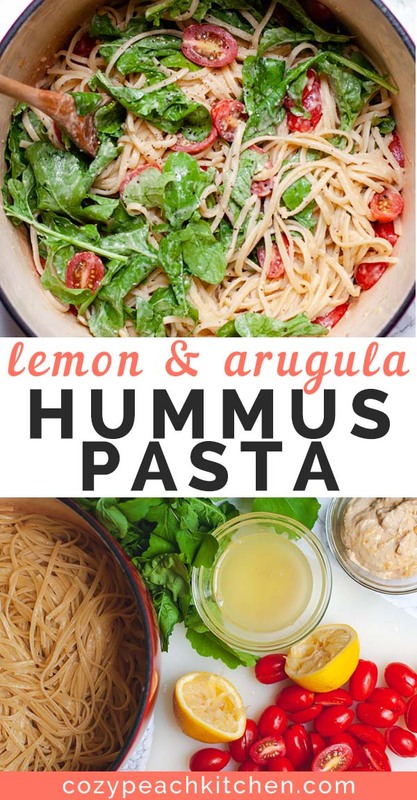 I always have hummus on hand for carrot dipping or sandwich spreads, and pasta is a necessary staple in any house. So what happens when you combine hummus and pasta? Apparently amazing things. I have had the idea in my head for a while, but only recently decided to try it out. And now I can’t stop eating this recipe for lunch! When mixed with liquid, hummus gets smooth and creamy, almost like an alfredo sauce. 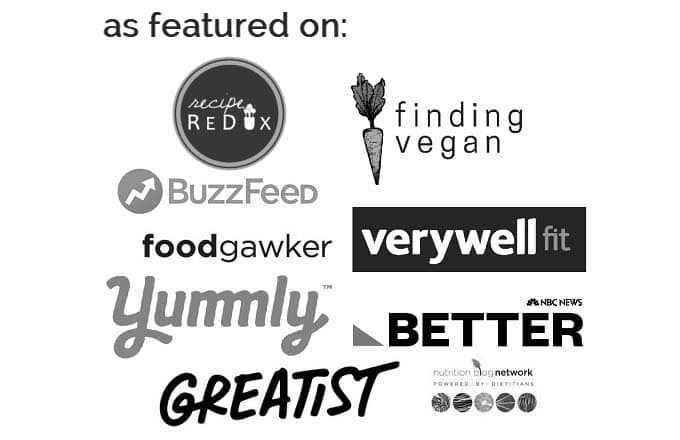 You can choose any hummus flavor for a variety of results! The best part? This recipe takes all of 15 minutes to make. And most of that time is spent waiting for water to boil and for the pasta to cook! Nutritious, delicious and perfect for spring! 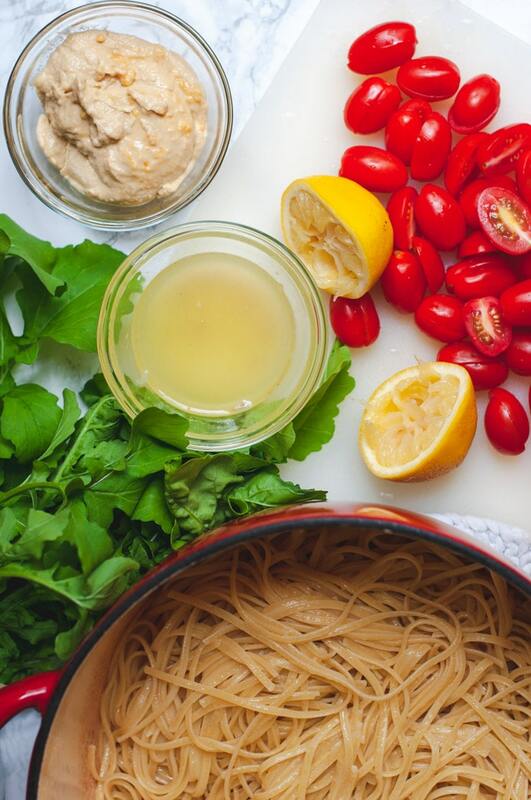 Hummus pasta hits all components of a healthy, filling vegan meal with only a few ingredients. Hummus. This delicious spread is made from pureed chickpeas and tahini. Tahini is a good source of plant-based protein and healthy fats. Pasta. 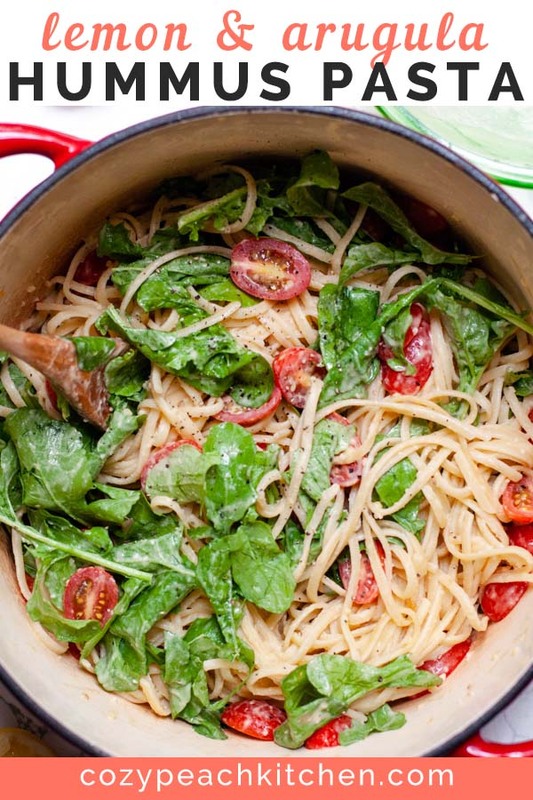 Choose your favorite pasta for a healthy dose of energy-providing carbohydrates. I prefer spaghetti or linguine, but short pasta will work too. 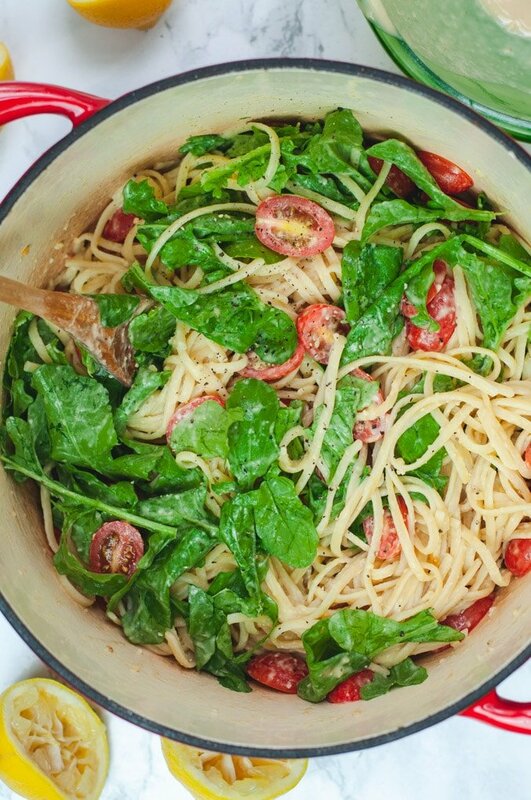 Choose white, wheat, veggie, or protein pasta. Arugula. Also known as “rocket”, this spring green is known for its fresh and spicy flavor. Stir it into the finished pasta for a boost of nutrients like Vitamin K and non-heme iron. Lemons. Though grown year-round, lemons are perfect to enjoy in spring for their light and fresh flavor! We’ll squirt two fresh lemons into the hummus for a bright burst of flavor. Cherry tomatoes. Fresh sliced cherry tomatoes provide potassium and Vitamin C, in addition to antioxidants like lycopene and carotenoids. Not a fan of cherry tomatoes? Try adding steamed broccoli, zucchini, or your favorite veggie instead. Choose your favorite hummus. I prefer to use plain or garlic hummus, but any mild, smooth hummus will do. Or try my favorite jalapeno hummus recipe for a spicy homemade version. Enjoy this recipe hot or cold. I like to enjoy hummus pasta cold for lunch and heated up for dinner. The hummus sauce will dry up a bit when cold. 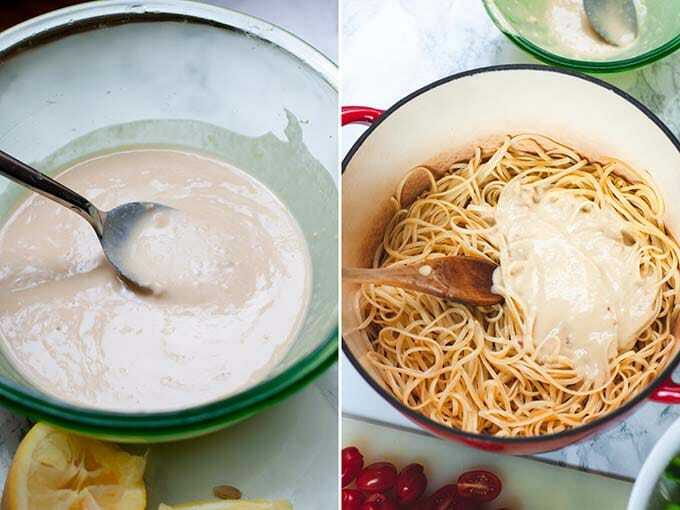 If you want an extra creamy, saucey pasta, just double the hummus sauce. 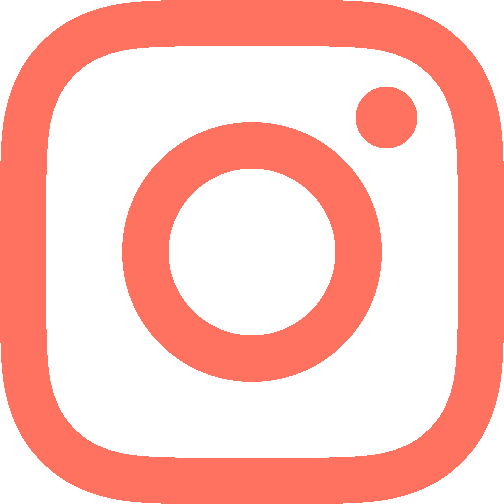 Looking for more quick & easy recipes? 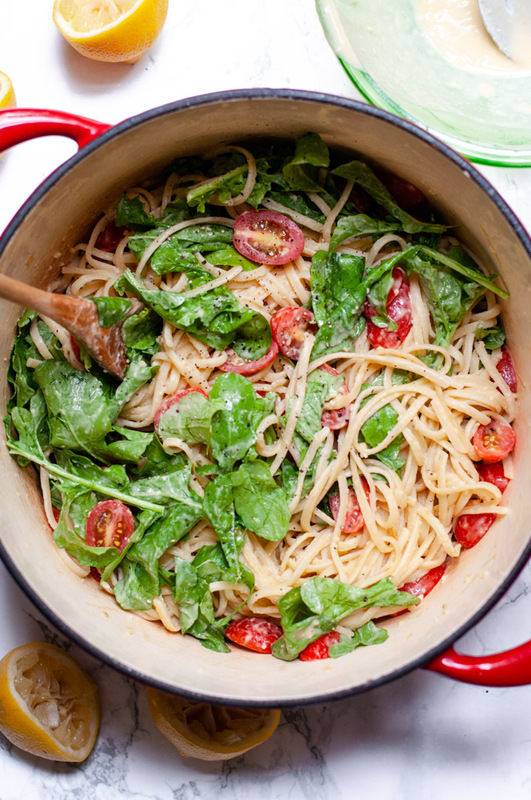 This 15 minute pasta recipe is bright and tangy, thanks to fresh arugula and lemon flavor. Cook pasta according to package instructions. Drain water and set pasta aside. Combine hummus and lemon juice in a medium bowl. Whisk together until creamy. It should have an alfredo sauce like consistency. Add water, 1 tablespoon at a time, to thin out as needed. Toss cooked pasta in the hummus sauce. 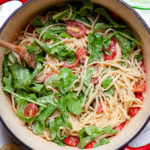 Stir arugula and sliced cherry tomatoes into pasta. Season with fresh cracked black pepper to taste. Enjoy!